The soup this week was something of a command performance. My wife and I are co-hosting a fund-raising dinner with another couple on Saturday and we wanted to offer jars of soup as a take away for the attendees. To be honest, co-hosting may be too generous a term. The couple we’re working with are not only extremely knowledgeable about food preparation and flavor combining, they’re highly gifted at the execution as well. What we’re doing is more like standing next to them, smiling and nodding as each dish comes off the line, wondering why we can’t cook like that. At this point, my wife is saying “What do you mean we?” Which is fair because she is taking care of the flowers which will definitely be more than professional quality. Okay, it’s just me who’s a little shell shocked. Anyway the theme of the dinner is an ABC of Italian wines with wines from the different regions paired with classic fall dishes. Naturally my soup had to be geographically correct as well. 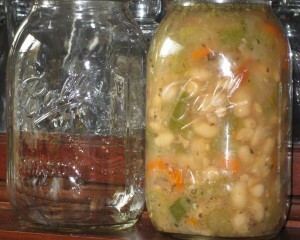 Considering the weather—it’s getting a little chillier again—I decided to try out a bean soup recipe. And the obvious choice for an Italian bean soup was minestrone. Not that I’m a minestrone expert by any means, I don’t think I’d ever made it, but how tough could it be? Some white beans, some chickpeas (also known as garbanzos or ceci beans in Italy), vegetables, and a little creativity. Piece of cake, or should I say pizza pie? (groan) Just the thing to boost my confidence again. Then I remembered my last published attempt at a bean soup and I got a little spooked. I was at the LA Times and had developed a menu featuring a mixed grill of meats and a bean soup reminiscent of my days in Berlin. I tried out the recipes in the test kitchen, had some pictures taken for the paper and logged the story into the system. So far so good. As is common with bean soups, my recipe called for soaking the dry beans overnight and using them in the soup the next day. Unfortunately, this pre-soaking ran counter to the deep-seated belief of one of my editors. The man was on a mini-crusade to eliminate the soaking process and skip ahead to the simmering. He felt that this made things a lot simpler and produced beans that were just as tender. In itself, that’s not a problem, except that as he edited the recipe, he eliminated not only the soaking process but all the pre-soak water as well. Sadly, readers who attempted the recipe soon learned that there wasn’t enough water left to even call the dish a soup. The following week’s food section featured a correction of the recipe, but the damage had been done. That experience left me a little battered as well. But now, at last, I’m ready to move on. The recipe this week splits the difference. I didn’t soak the beans overnight but I did do a quick soak to make the beans a little softer before I started cooking. My old editor may never forgive me, but I prefer being safe to being sorry again. The resulting soup is delicious—the addition of fennel seeds gives the mix a flavor unlike any minestrone I’ve ever had. Not that anyone in my family can confirm this. The whole batch has been transferred into mason jars and now awaits delivery to the party guests. I really hope they like it. I know they’ll like the rest of the food. As for me, I’m heading back to the kitchen. I’ve got some ABC’s to re-learn. Place beans and water in a medium-sized pot, bring to a boil, then reduce to a simmer for 30 minutes and set aside to cool. Fry bacon in a 3 quart stock pot and set aside. Sauté onions, carrots, and celery in rendered fat until tender. Heat oil in another medium sized pot sauté the zucchini, and garlic over medium heat until lightly browned (5-7 minutes). Add beans, vegetables, basil, fennel seeds, bay leaf, stock and seasonings to the 3 quart stock pot and bring the soup to a boil before reducing the heat and simmering the soup for another 30-45 minutes. You may serve it now or hold until the next day when it tastes even better. Either way, serve the minestrone warm with grated parmesan sprinkled on top. Image Credit: Minestrone, Before and After Photo by author. They say that the problems of three little people don’t amount to a hill of beans in this crazy world. Do they at least amount to a pot-full of beans, because then we can make some soup. Let me know where you come down on the soak vs. no-soak question. I’ll be reading and responding. I’ll post the results too. I’ve enjoyed your stories and recipes–and I love bean soup, so I’ll have to give this one a try. But, I’ve been wondering if you’ll put together a crock-pot soup or some other recipe for folks who have little time for cooking? Thanks for the comment, Karen. My problem is that I don’t have a crock-pot. I do think a lot of these recipes would be conducive to crock-pot cooking. If you like I could create a crock-pot category and flag which recipes would work with that kind of long, slow cooking. Was that R.P.? I guess He didn’t suffer as much as you did. I wonder if he reads your blog. I gave your address to Ron Paolucci (another R.P.). I thought he would be inerested in both the writing & the cooking. Glad you’re spreading the word. Hope RP likes the blog, and I mean that globally: All RP’s everywhere. Gasp! No crock-pot? I considered mine essential enough that I dragged it out to Oregon with me, despite its substantial weight and bulk. Well, you’re welcome to borrow it when I return to Chicago in January! Welcome back. It is nice to try new things. Although, sadly, the one soup a week thing is preventing me from revisiting anything from the past. Oh well. On to the next one. Good luck with the minestrone and thanks for the comment. Jamie was making this last night, and even sans bacon, it smelled amazing! I’m going to have to take a shot at it this weekend. Well happy birthday. I know it’s not much, but it’s a start. I look forward to hearing how it goes. In the meantime, it’s on to more soup. I’m curious how all these vegetarian options taste. I’ll have to stop by and try some one day. I just made this today, and it’s amazing! Far and away the best minestrone I’ve tasted. I can’t wait till tomorrow after the flavors have married further. Glad it went well. Thanks for the nice words. And you’re right, I’ll bet it was even better the next day. I appreciate the comment.